This is no way to spend a vacation but I've realized that unless I make some effort to keep up I'll face a huge pile of reports when I return on July 7. Okay, the real story is that I've been up all night thinking about what might be inevitable. Bloomberg Business presented data on June 24 showing an overwhelmingly certain correlation between the warming global temperature and manmade greenhouse gas emissions, then concluded by asking what we're going to do about it. Well, what I'm going to do about it is take Bloomberg Business financial analyses with a large grain of salt going forward. I figure if they're that credulous about climate data they can easily be duped by fast talking Wall Street wizards. Here is Robert Zimmerman's latest discussion of climate science: More evidence NOAA has tampered with climate data (March 10, 2015). He's not credulous; he can't afford to be. He's had to spend many years analyzing American and Russian discussions of their government space exploration programs. Unfortunately he doesn't give financial advice. The terror is that hyperfocus on reducing greenhouse gases has diverted attention and vast amounts of money from crises that have relatively simple fixes --ony it takes more time than we might have to implement them. Environmental reporter Abrahm Lustgarten began investigating the water crisis a year and a half ago for the ProPublica series Killing the Colorado. He tells Fresh Air's Dave Davies that he initially thought the water crisis was the result of climate change or drought. Instead, Lustgarten says, "It's the policy and the management that seem to be having a greater effect than the climate." California’s Drought Is Part of a Much Bigger Water Crisis. Here’s What You Need to Know - 6/25; latest in ProPublica's Killing the Colorado series. The Golden State needs 150% of average rain and snowpack to beat drought ... If El Niño continues to gather momentum, California may get what it wished for -- lots of rain. But if it turns out to be weaker than expected, as was the case in 2014, California’s drought is likely to extend into a fifth year. California’s drought is breaking all records since the state began monitoring rainfalls and temperatures in 1895. 2013 was the driest on record for the state and 2014 was the warmest, while snowpacks, an important source of water as they melt, were the lowest on record at only 5% of the 28-inch average this year, Anderson said. Daniel A. Prohonic: "If you want to refill the lakes, rivers and aquifers in California and western ends of Utah and Nevada, try turning off or covering the solor [sic] panels in those states 6 months before expected arrival of El Nino. Also shut off wind farms; they're heating the air too much, causing the rain clouds to rise and hold their water until they're passing the Rocky Mtns." Your guess is as good as mine about whether there's anything more than hot air to his observation about solar panels. But his comment about wind farms might have been inspired at least in part by a February 2014 Scientific American article Wind Power Found to Affect Local Climate: "Wind farms can alter the nearby rainfall and temperature, suggesting a need for more comprehensive studies of future energy systems." The disadvantage is that the model of climate behavior may not correspond exactly to what happens in reality. The observation holds true across the entire of climate research and indeed all modern science, which relies increasingly on modeling. But pile up many small inexactitudes in your models of reality and you can end up with hopelessly skewed conclusions. All fire-fighting planes had to be grounded (temporarily) because a couple drone hobbyists wanted a lookee-see at the fire. Provides update on firefighting efforts against wildfires started earlier in the state. The lightning seems to be "dry." See Freedman's discussion below. The wildfires are burning across central and southern portions of the state, and have been increasing over time as summer thunderstorm season gets underway, touching off storms that deliver little rain but lots of lightning. These storms are known as dry thunderstorms, and they're a major cause of fires from Alaska to Canada and across the parched Western U.S. The fires are far above average for this time of year, and are in keeping with a long-term trend toward more frequent fires and larger fires in the "Frontier State." I'd say the heat has exposed the power issues even more; they've been famously known for many years. The issues boil down to the fact that Pakistan is a military with a civilian society tacked on as an afterthought. That concept of a country made for huge problems going in all directions when the population skyrocketed and many were crammed into one city -- Karachi. The official death toll has gone up since then to a little over 1,200; even though the temperature has eased since last week those in critical condition from heatstroke, etc., have been dying. ... "Over the last two years," he explains, "the North Korean government has been implementing a new and remarkably efficient policy which is based on the household responsibilities. So farmers' households are given 30% of the harvest instead of the fixed rations they used to receive in the past. And as a result, they work much better, and over the last two years North Korea had really good harvests. Essentially they produced enough food to feed themselves." Brian Davis, chief of the Freeport Fire and EMS Department, said extensive flooding earlier this month caused the overflow of septic tanks and waste treatment plants. "The simple truth is that all of that is running down the river," said Davis, who said the bacteria can turn Gulf water into almost toilet water. ... The Freeport Fire Department sent out an advisory warning of "medium" bacterial levels at Bryan Beach. In Galveston, levels tested even higher. The Galveston County Health District is now advising people to avoid swimming in some beaches altogether because of what's in the water. Not just Washington state, the entire American northwest got hit with a haze from the Siberian fires mixed with some "Asian dust" -- toxic yellow or red dust to be specific, blowing off the Gobi and mixing with China's infamous industrial pollution. Just a timely reminder for those cute people in Washington, DC's defense establishment who've forgotten that fallout from a nuclear weapon explosion travels fast and far. Computer models used to forecast climate change also typically predict that in California the effects of global warming due to increased carbon dioxide levels should warm temperatures in the Sierra Nevada mountains faster than in the nearby valleys. The UAH study, however, found that from 1910 to 2003 night and daytime temperatures in the nearby mountains did not climb. Does irrigation in the desert, on the massive scale it's been done in the California's Central Valley, significantly influence the weather? It must have some effect, as the earlier study (above) shows, but how much and in the way the lead researcher on the second study (Famiglietti) believes -- I don't understand the arguments well enough to take a guess. Anthony Watts, who runs WUWT --"The most viewed site on global warming and climate change" -- discusses both studies (see links above) and presents data he collected, which supports the conclusion in the first study. Unless my eyes deceive me, it looks like there is no net change in global drought area for 30 years. The graph shows the proportion of the planet in drought, by intensity, 1982-2012. The graph comes from a paper in a new Nature publication called Scientific Data and is open access. The finding if correct wouldn't surprise me; what we're really seeing with all the horror tales of drought across the globe is a runaway increase in the number and intensity of hydrological droughts. That is, droughts caused by decades of bad water management that are now catching up with societies as megapopulations and water-intensive industries and agribusiness draw down water tables faster and faster. Add a period of sparse rainfall and that's a recipe for catastrophe -- cascading catastrophes, as populations fleeing water scarcity move into regions that have very limited and fast diminishing water supplies. Just last week it was reported that the Dominican Republic came within a month of its entire water supply collapsing. A 2013 Dominican citizenship law aims to cut off more than 200,000 Haitians who were born in the country to undocumented Haitians. Many of these could be children of parents who fled Haiti after the country's catastrophic earthquake in 2010. But the question would be how many Haitians fled to the Dominican Republic during Haiti's droughts in 2013 and in the country's northeast in 2014. Haiti has suffered one natural disaster after another since the earthquake; add to this the country's water infrastructure is a disaster. (Bloomberg) — South Africa is facing water shortages after the worst drought since 1992 cut dam levels by 12 percent from a year earlier as most of the country enters its four-month dry season. Drought in eastern and central South Africa around the turn of the year has slashed corn and sugar output and may trigger water shortages for homes and businesses. Weaker river flow also threatens water quality. South Africa is the 30th-driest nation on Earth, according to the government, which expects water demand to outstrip supply as early as 2025. 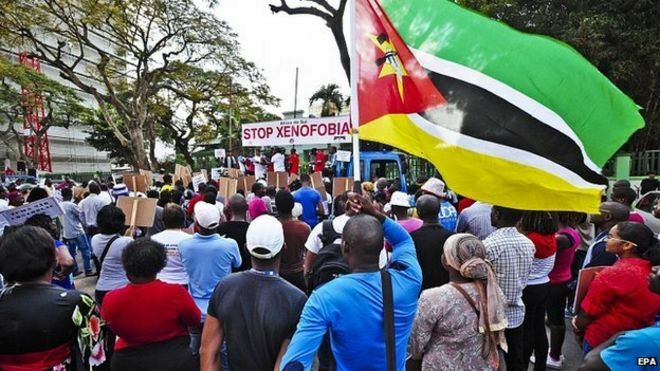 South Africa has deported more than 400 Mozambicans, weeks after anti-foreigner violence in Durban and Johannesburg left several people dead. The move follows a police operation that uncovered hundreds of undocumented migrants. Mobs targeted workers from Zimbabwe, Nigeria, Mozambique and other African countries. The government will have more than illegal job-takers to worry about when Mozambique is hit even harder than it was last year by its boom and bust cycle of drought and floods. 300.000 Mozambicans faced famine in 2014. Human rights activists are upset, but they need to stop thinking as if the year is 1982. Today the huge migrant waves descend on cities that have stressed water supplies not to mention stressed power and sanitation infrastructures. There is a kind of sugar cube syndrome generated by the mega-cities that's accelerating. Put a cube of sugar on a desert floor and first hundreds then thousands of ants emerge from the ground and descend on the cube. Within moments it's gone. The syndrome isn't limited to urban areas. Building rural roads, as the Brazilian government learned the hard way decades ago, doesn't only facilitate transporting produce to urban centers. The roads also facilitate fast migration. One day the government turned around and saw huge areas of the Amazon rainforest had gone up in flames. Farmers had used the roads to quickly migrate deep into the Amazon to create new farmland by the traditional slash and burn method. Which is to say that many of the best development ideas, implemented in the 1980s, are now turning on us. What happened with the rainforest was the harbinger and now the leitmotif of the present era. [flipping a pen in the air] Sigh. Sigh. [...] According to Sediqi an ISI officer, Bilal, helped Haqqani network operational commander Maulvi Sherin in the planning. The attackers were provided about $75,000 for the execution of the attack on the Afghan legislative body. Sediqi did not have enough information to determine whether Bilal was working on behalf of ISI or on his own. The two countries have recently signed a first of its kind memorandum of understanding to cooperate on intelligence sharing, as well as possible joint investigations of terrorism suspects. According to Sartaj Aziz, Pakistan's advisor on national security and foreign affairs, the deal was initiated by Kabul. Afghan NDS spokesman Sediqi could not say whether there would be a joint investigation between the intelligence agencies of the two countries in the case of the parliament attack. KABUL (Pajhwok): The Afghan spy service on Wednesday alleged the Monday’s group suicide attack on the parliament was carried out by the Haqqani Network in line with a plan designed by an Inter-Services Intelligence (ISI) officer. The National Directorate of Security (NDS) spokesman, Hasib Siddiqui, told Pajhwok Afghan News the attack had been jointly designed by Maulvi Sherin, the Haqqani Network’s operational commander, and the ISI officer, Bilal, in the Board area of Peshawar, the capital of Pakistan’s northwestern Khyber Pakhtunkhwa province. He said Bilal hailing from the Zakhil tribe maintained close and direct links with militants in the Tirah valley of Khyber Agency. The NDS official added 7.5 million Pakistani rupees had been set aside for the attack on the Afghan parliament. He said the Afghan spy agency had dispatched prior information to the ministries of defence and interior about possibility of such an attack. According to Hasib, additional troops had been deployed in the vicinity of parliament to foil the attack and Essa Khan, a brave soldier who eliminated six assailants, had been part of the reinforcement. In Islamabad, Dawn.com quoted Foreign Office spokesperson Qazi Khalilullah as rejecting the allegation on ISI. He said this was not the first time such claims had been made by Afghanistan's intelligence personnel. Sediqqi says the suicide car bomb used in Monday's attack was manufactured in Peshawar, Pakistan, just across the border. And the report specifically refers to Bilal as an "intelligence officer," although whether the term is meant precisely in this case, I have no idea. Well, the Old Order isn't leaving quietly, is it? For all its deadly and destructive effects, the storm moved relatively swiftly across the region. Though severe in its effects, the line of storms had moved on from many parts of the Washington area before nightfall. As they were illuminated by the setting sun, some of the last clouds to scud across the sky seemed to have a silver lining. And in some places, the departing clouds reflected the day’s last golden rays of sunshine. I'll return July 7. I wish American readers a great Fourth of July. Installed in 2014 to Afghanistan's presidency through an exercise in democracy that would have been recognized by America's old-time ward heelers (keep sending them back to the ballot box until the vote comes out right), Dr. Ashraf Ghani Ahmadzai's long career at the World Bank included "five years each in China, India, and Russia managing large-scale development and institutional transformation projects that made what is today's economy in China," according to Wikipedia 's article about him. It is President Ghani's pride in his accomplishments in China that might actually be more troublesome for Afghans than his naivete about how things work in Pakistan. But moving away from that unkind speculation, it's extremely important for Ghani to realize that when it comes to Pakistan he can't buy the London Bridge from the British government because it's already been sold. Ghani also needs to grasp what the British government figured out long ago: Pakistan's rulers can't be satisfied with merely having influence in Afghanistan; they want to run the country. Unfortunately Whitehall never got around to sharing that fact with the American defense and diplomatic establishments, perhaps out of concern the revelation would be traumatizing to them. Instead, the British told the Americans that the only way to keep the unrest in Afghanistan to a dull roar was by arranging it so Pakistan's government had influence in the country. ... since Ghani took charge as president after a controversial election rife with allegations of fraud, there has been a visible shift in Afghanistan’s policy towards Pakistan. Ghani has been more hands-on in his approach and seems to believe that for an effective reconciliation and peace in Afghanistan, getting Pakistan on board is essential. This view is also shared by the Americans and the British, who despite saying that a solution to the Afghanistan crisis needs to be Afghan-led, have always maintained that Pakistan is the key to solving the problems in Afghanistan. Actually Karzai wasn't anti-Pakistan -- although he probably is today -- and he made sincere and energetic attempts during his presidency to work with the country's government; it's just that he's knowledgeable about Pakistan and his attempts were in vain. But the Pentagon report held out an optimistic prediction for better ties between Pakistan and Afghanistan under the new Afghan president, Ashraf Ghani. It said: "Suspicion has surrounded the relationship between Kabul and Islamabad, inhibiting bilateral cooperation on border security protocols. It is possible that the new Afghan President, Dr Ghani, will seek to change this dynamic, which Pakistan is likely to welcome. Although stability in Afghanistan is in the interest of Pakistan, Pakistan also seeks sufficient Pashtun representation in the Afghan government to prevent Pashtun discontent along the Afghan-Pakistan border and limit India's influence." I wonder if the Pentagon would be interested in purchasing the Tower of London. In a challenge to European leaders before a summit that aims to tackle a refugee crisis, Hungary unilaterally suspended an EU asylum programme on Tuesday, saying it was overburdened by illegal migrants. Plenty more in the report. Trying to read between the lines of the report, it strikes me that EU leaders seem unwilling to confront the fact that the more they've said yes, the bigger the migrant swarms have gotten. This has made it increasingly hard to separate the real refugees from the job- and welfare-benefits seekers and those who just prefer to live in Europe. Many if not most of the migrants, however, are Muslims, and many of those Muslims breed like rabbits because they practice polygamy. Modern societies simply can't support the practice, which has been eating all but the richest Muslim governments out of house and home. Now the polygamous swarms are going to pick Europe clean. So aren't the Europeans carrying their desire for cheap labor a bit too far? And notice from the Reuters report that the swarms aren't actually interested in staying in Hungary; they want to move on to richer European countries. Fancy that: the Country Connoisseur Migrant. By the way, Obama has also dragged Americans into supporting a full blockade of Eastern Ukraine, which is as much saying Americans are supporting an ethnic cleansing. Meanwhile, Obama wants Americans to focus on the evils of racism and on being nicer to Muslims. Where is the American anti-war Left on Obama's latest example of leading from behind? Silent as the grave. Where is the American mainstream media? Silent - although from comments John Batchelor made during his conversation with Dr Stephen F. Cohen last night, it's possible Charlie Rose is becoming a little alarmed. If so, his alarm is coming far too late in the day. Here's the latest on the crisis from John Batchelor's Show, the only media outlet in the USA that is reporting on it in enough detail to convey what is actually going on. But why bother to alarm Americans since there's nothing we can do about it? Only the Europeans can avert a looming nuclear confrontation, and it's getting to the point where the only way out for them could be to leave NATO. However, the Europeans are suffering from Deer in the Headlights syndrome. They don't want to believe that an American President is certifiably insane. "Just last month, days after PM Modi’s maiden China visit ... China had blocked Indian efforts to seek United Nations Security Council sanctions against another terrorist based in Pakistan ..."
NEW DELHI: After China blocked action at the United Nations against Pakistan for freeing 26/11 mastermind Zaki-ur-Rahman Lakhvi, Prime Minister Narendra Modi expressed India's grave concern "at the highest levels" to Beijing, said sources. Sources said PM Modi raised India's concerns regarding China's stand on Lakhvi with senior Chinese leader and Standing Committee chairman of the National People's Congress, Zhang Dejiang, who was in Delhi last week. Lakhvi, accused by India of planning and executing the terror attacks in Mumbai in which 166 people were killed, was released in April from a Pakistani prison. The UN Sanctions Committee, which met earlier this month in New York at India's request, was to seek a clarification from Pakistan on Lakhvi's release; however, China blocked the move on grounds that India did not provide sufficient information. I question that Lakhvi planned the 2008 attack on Mumbai, and if the trial ever gets off the ground there might be enough evidence presented to add to other evidence suggesting that the ISI was the mastermind. Just last month, days after PM Modi’s maiden China visit (14-16 May), China had blocked Indian efforts to seek United Nations Security Council (UNSC) sanctions against another terrorist based in Pakistan, Hizbul Mujahideen chief Syed Salahuddin. China had put the Indian move of listing Salahuddin as a UN-designated terrorist on technical hold. If Indian moves at the UN with regard to Lakhvi and Salahuddin had succeeded under UNSC resolution 1267, it would have marked a major diplomatic victory over Pakistan as all member countries would then be obliged to enforce travel bans and freeze their assets. But China has thrown a spanner in the Indian works and openly come out in support of Pakistan even though it is well aware that Pakistan’s track record in encouraging terrorists can cause a major problem for Beijing in the future. The Chinese conduct goes against its pledge to work closely with India on counterterrorism. Notably, the India-China joint statement, released after PM Modi’s China visit, had urged “all countries to work sincerely to disrupt terrorist networks and their financing”. It shows that bilateral documents like joint statements and joint declarations are nothing but waste papers when it comes to China’s all-weather friend Pakistan and China is prepared to turn a blind eye to Pakistan’s shenanigans. This is something that is known world over and New Delhi, too, has never been under any illusion. Modi’s predecessors Manmohan Singh and Atal Bihari Vajpayee, too, huffed and puffed while preparing their China policy on account of the Pakistan factor. China is Pakistan’s biggest benefactor on the world stage today because no other nation has given China the kind of strategic heft and politico-economic leverage as Pakistan has. Forget about the key role played by Pakistan in bringing about a US-China détente decades ago. Forget about the key role being played by Pakistan for furthering Chinese interests in Afghanistan. Today, China’s ambitious trans-continental Belt and Road Initiative (BRI) is predicated on Pakistan's cooperation and to ensure its success China has rolled out the $46 billion China-Pakistan Economic Corridor (CPEC) project for Pakistan. Forget whether the BRI and the CPEC would come to fruition ever. The fact that so much is riding on Pakistan for China that bailing out Pakistan on global platforms is a very small price which China is willing to pay. China’s huge economic commitments in Pakistan is the key reason for China’s blind support to Pakistan on any and every issue. With these moves Beijing has let India realize indirectly that even though major powers like the US, Russia, France and Germany are supporting India on the Lakhvi issue, China still has its say over matters, especially pertaining to Pakistan. Significantly, China’s move is an attempt to snub India and a counter to Indian efforts to put pressure on China on the South China Sea standoff by the US-led western community and India’s support in this regard. The recent Indo-US summit had seen the two sides coming up with a separate document on South China Sea issue for the first time. Pakistan knows this and looks upon China as its biggest benefactor, bigger than even Saudi Arabia. See also June 24 RFE/RL article, "Unprecedented" Surge Of Militants Plagues Afghanistan, UN Told, compiled from AP and AFP reports. The [central] government has made efforts, but there's a weakness in leadership. The government's mismanagement has exacerbated the problems in the region. Instead of solving problems, the government is creating more challenges. For example, the government doesn't have any organized military plans and it shows our weakness to the enemy. On the other hand, the enemies of Afghanistan have become more active because of a new geographical shift. We are in a very dangerous war. If we take the right measures, we will be able to tackle the problems easily. Asraf Ghani's government, as with his predecessor, has always been very reluctant to encourage former warlords to rearm and fight the Taliban but now the situation is so dire in Afghanistan's north, Kabul has given the unlikely team its blessing. Atta Mohammad Noor, the powerful governor of Afghanistan's Balkh Province, says he has forged an alliance with the unlikeliest of candidates -- former rival warlord and First Vice President Abdul Rashid Dostum -- in order to combat the Taliban in the country's restive north. Noor, speaking exclusively to RFE/RL on June 23, said the two political heavyweights had set aside old rivalries to fight against the Taliban and other militant groups active in the region. "This alliance is meant to bring peace and security to the region and push back our enemies," said Noor. The alliance between Noor's Jamiat-e-Islami party and Dostum's Junbish party is unprecedented, given past hostilities. Dostum -- an ethnic Uzbek former militia leader -- and Noor -- an ethnic Tajik who has ruled Balkh for the past 12 years -- were locked in fierce battles for control of the north during the country's devastating civil war in 1992-96. Fighting continued after the U.S.-led invasion in 2001 until a power-sharing agreement was signed three years later, in which Noor was given control of Balkh. As violence spreads across the country's north amid a major Taliban offensive that began in April, Noor told RFE/RL that many northern provinces were in danger of being overrun. Noor, a former mujahedin commander, said the two sides were "coordinating Afghan security forces in the provinces to repel enemy attacks." The governor said the sides were working with the full support of the central government and that they were taking steps to "reinforce the alliance." The Taliban launched their annual spring offensive in April with attacks in the provinces of Kunduz and Badakhshan, where the militants captured several districts. Afghan security forces have managed in many areas to beat back the militants, recapturing territory lost to the Taliban. In the latest fighting, Afghan forces on June 23 recaptured a key district close to Kunduz's provincial capital, repelling Taliban fighters who had threatened to overrun their first provincial capital since being toppled from power in 2001. Noor said he had sent soldiers and police from Balkh to join local government forces in Kunduz. This year's Taliban offensive marks the first fighting season in which Afghan forces are battling the insurgents without the full support of U.S.-led foreign combat troops. Noor said Afghan forces were capable of fending off the Taliban, but said "stronger leadership" was required on the part of the central government. He said the "weakness of the government" was partly to blame for the soaring insecurity in the north. Noor's relations with Kabul have been tense in the past and the governor has accused Kabul of neglecting security threats in northern Afghanistan. "Anyone familiar with the literature already knew all this, but of course the typical American is listening to 30-second television commercials that say 'marijuana cures cancer' ." But of course the "typical American" is listening to the TV commercials. The question is why those commercials are being broadcast. I'd say the answer is money talks and big money shouts. Oh and by the way, don't worry about the dosage amounts: Forbes report June 23 Wide Variability in Potency Plagues Medical Marijuana Edibles, JAMA Study. Despite medical marijuana's unquestionable worldwide momentum, it hasn't yet scientifically proven to remedy most of the conditions governments have authorized it to treat, according to an influential new analysis of existing research. While pro-legalization advocates don't disagree with the analysis' findings, they point out that the barriers to legitimate research on cannabis' medical efficacy have been so substantial in the U.S. that President Barack Obama's administration this week slashed some of those bureaucratic hurdles in a historic action — and yet marijuana still remains more difficult to study than cocaine or heroin. The new compendium's findings, published in the Journal of the American Medical Association on Tuesday, are based on 79 trials involving nearly 6,500 participants. The analysis found that marijuana helps with some ailments, but its efficacy regarding most related conditions is unproven — a finding that didn't surprise the chief medical officer of Colorado, where medical pot was legalized in 2000. "It's pretty consistent with our take and our observations within CDPHE and within the state," said Larry Wolk, executive director of the Colorado Department of Public Health and Environment. "We all recognize that we're lacking a bit in credible research, even amongst conditions that are deemed appropriate in different states, including Colorado, for medical marijuana." Also, report today from the BBC on the "Calais migrant chaos" yesterday. UPDATE 6/23: Video and 7:04 PM news report from NBC News on the chunnel closing and migrants trying to take advantage of the ensuing chaos, which could continue until Friday. (Channel Tunnel Chaos: Stranded Travelers Told to Wait Till Friday) One stranded British motorist angrily told NBC that the migrants weren't refugees, that they wanted to get into the UK to take advantage of the country's (welfare) benefits. From the photos and anecdotal accounts in a (UK) Telegraph report it seems hundreds rather than scores of 'refugees' were involved. Looks like the situation has been going on for a long time before the chunnel chaos (see links to earlier Telegraph reports in the report below). It's just that the chaos made it international news -- and brought pressure on British authorities. What do the illegals say about why they want to leave France? France isn't good enough for them, from what one of them told the Telegraph. The French treat them like animals, he said, whereas the British treat them like humans. Uh, when you're a refugee from a place like Syria, you're complaining about French attitude? French ferry workers initiated the chaos in England and France by blocking the port and entrance to the Channel tunnel, even burning tyres on the tracks. Hundreds of illegal migrants then seized on the miles of tailbacks caused by the blockages to try and jump onto lorries bound for the UK without being spotted. James Brokenshire, the Immigration Minister, told the BBC: "We are putting additional resourcing into the port of Dover to enhance screenings and detections there so that we're looking at this on both sides of the Channel." He said the current situation was "hugely regrettable", but that is was “ultimately” the responsibility of the French authorities to tackle the chaos seen throughout Tuesday in Calais. The migrants lined junction 42 of the A16 motorway, the main entrance for cars and lorries taking the Eurotunnel to the UK, approaching trucks in small groups and trying to board by all possible means throughout the night. Eurotunnel said the number of migrants in the Calais area was the “highest ever” as stranded motorists were warned to keep their doors locked. Truck drivers were advised not to stop within 60 miles of the port, congregate with other drivers and make sure padlocks were kept on vehicles. With Calais ferries, Eurostar and Eurotunnel services expected to face huge delays into Wednesday, Britons who tried to find rooms in a string of hotels in and around the port before sunset to avoid spending the night sleeping in their vehicles. Daniel Hunt, 40, from Balcombe, Sussex, was returning to the UK from Belgium with his father and brother after visiting Second World War bomber crash sites. After nightfall on Tuesday, dozens of gendarmes in fluorescent jackets lined either side of the road as groups of migrants waited for a moment of inattention to sneak on board lorries, which were still moving at a crawl towards the Eurotunnel terminal. The Telegraph saw gendarmes open the back of a Dutch truck and pull out two migrants who had hidden in amongst cardboard crates of what looked like vegetables. “This is the first time I’ve ever had any in my lorry,” said trucker Adam Zoon who had driven from Rotterdam. “I feel bad as they are poor and with nothing. But they are stopping me doing my job,” he said as another migrant was pulled out from a neighbouring truck. The police simply let all the stowaways go and they were welcomed by a group of Syrians and Eritreans who patted them on the back. Ali, a 29-year-old from Syria and who arrived 34 days ago, said he had managed to hide in the back of a lorry and “almost made it” to the tunnel entrance. “The lorry driver must have sensed I was there because police opened up, shouted and pulled me out,” he said. He said that he had heard about the ferry workers strike, and that all the trucks had been diverted to the tunnel. “They are even more strict than usual and are checking every vehicle,” he said. Despite this, he knew of one fellow countryman who had got through. “I would think that around 50 will make it to the UK tonight,” he said. A Gendarmerie spokesman said: "We have mobilised more units than usual given the exceptional circumstances. It's clear there are many more migrants than normal." See video at OneIndia of a ISIS flag-waving incident. There have been dozens of such incidents in Kashmir Valley during the past few months, the most recent one on Friday, June 19, the date the video was filmed. After chasing in circles, India's intelligence agencies were unable to find evidence of ISIS activity in Kashmir. This raised suspicions that the Usual Suspects were at it again. OneIndia reported on June 19 that the Indian government's investigation turned up two youths who were being paid by Pakistan's Inter-Services Intelligence agency (ISI) to hire other youths to wave the ISIS flag at events with predictably big Indian media coverage -- Kashmiri separatist rallies and street protests and after every recent terrorism incident in the valley. Those familiar with the ISI's modus operandi, which relies on the use of lashkars (militias) to stage proxy warfare, would have no trouble figuring out the reason for this literal false flag operation. The ISI is trying to cast blame on ISIS for the latest uptick in terrorist violence in Kashmir Valley, which Indian intelligence has already pinned on two notorious ISI-controlled lashkars, Hizbul Mujahideen and Lashkar-e-Tayiba (LeT). Indian Intelligence Bureau officials tell OneIndia that the propaganda of the ISI is clear. It wants to give an impression that Kashmir is at risk of being taken over by the ISIS. The ISI feels that the locals would look towards either the separatists or the Pakistan sponsored terrorist groups for protection against the ISIS. Makes sense, but Pakistan's civilian government has been working hard to persuade Western governments and the United Nations that it's abandoned its bad old ways. ISIS is a handy peg on which to hang accusations of terrorism. If they stick to flag-waving and other hot air to give the impression that ISIS is on the loose in Afghanistan, that would be one thing. More worrisome is that ISI has never been choosy about its mercenary fighters. Haqqani Network, LeT, "Good" Taliban, al Qaeda, little green men from Mars -- makes no difference. UPDATE 6/24 - 6:00 AM EDT -- Well, the story is making some headlines today. See AP report Caribbean Facing Widespread Drought And Water Shortages by Danica Coto. So it's not only Puerto Rico. In the nearby Dominican Republic, water shortages have been reported in hundreds of communities, said Martin Melendez, a civil engineer and hydrology expert who has worked as a government consultant. "We were 30 days away from the entire water system collapsing," he said. I should mention that UPI beat Slate to the punch by more than a month and that Al Jazeera reported on the crisis on May 25. I am steamed because there was nothing about the issue posted at Google News. Google needs to stop prioritizing news headlines according to what Fox and CNN determine is top news. The way I learned about the crisis was from the new Los Angeles Times "Water and Power" newsletter quoting the Slate article. Be Thankful, California. At Least You’re Not Puerto Rico. In California, reservoir levels are plummeting. The state’s precious mountain snowpack is already gone. On Thursday, a huge wildfire in the San Bernadino National Forest grew in size by 500 percent in just four hours. This weekend, a fire near Lake Tahoe exploded to seven times the size of New York City’s Central Park in little more than half a day. Both were visible from space Sunday night. Temperatures are soaring, locking in drought for months if not years to come. “The situation is grim for everyone and everything,” said Charlton H. Bonham, director of the California Department of Fish and Wildlife. At least it’s not Puerto Rico. Last week, the Puerto Rican government ramped up drinking water rationing for 200,000 users in the San Juan area, permitting households to draw water only every third day. Rainfall deficits have been building up since 2013, drying up rivers and streams at a record-breaking pace. It’s become one of the worst droughts in the island’s history. But the situation in Puerto Rico is much more complex than just a lack of rain. Last month, Gov. Alejandro Padilla issued a state of emergency over the drought, which he blamed partly on the island’s struggling economy and the low priority given to water storage by previous governors. Padilla has appealed to Congress for the ability to declare bankruptcy and at least partially eliminate a whopping $73 billion in debt. Water rationing will only worsen the fragile economy, currently mired in an eight-year recession. John Morales, a Miami-based meteorologist who provides weather forecasting services for the Caribbean, said Puerto Rico’s government could actually be underestimating the seriousness of the problem. The island’s dwindling reservoirsare so silted up from bygone years of intense tropical downpours they’re not able to store as much water as the government thinks they can. “The capacity of the reservoirs has been severely compromised by sedimentation and lack of maintenance,” Morales told me. What’s worse, he said the island’s “crumbling infrastructure” is producing “huge losses” of water from innumerable leaks. Question for our dear British allies: So how's that Pakistan peace initiative working out for Afghans? As a damage control, [Afghan President] Ghani took recourse to some hardline rhetoric against Pakistan, by accusing it of waging an "undeclared war". "The Taliban have declared their spring offensive, massive terrorist attacks have been carried out," he said in a letter released to the media at an international security conference in Doha. "The public is asking whether there has been any return from President Ghani's efforts to secure enduring peace and cooperation with Pakistan?" the letter states. "[O]ne clause in the agreement states that the intelligence agencies of Afghanistan and Pakistan shall not criticize each other in public." "There is information that this controversial agreement was prepared with the help of the UK." "An official in the Intelligence Bureau in India says that it is hard to understand what the UK stands to gain out of this exercise." Recently the intelligence agencies of Pakistan and Afghanistan entered into an agreement aimed at improving ties and cooperation. Among the various clauses that are part of the agreement, the one which states that the intelligence agencies of both countries shall not cooperate with hostile nations comes as a surprise to India. India had built a rapport with Afghanistan and had been indulging in intelligence sharing. A large part of the Afghanistan establishment saw Pakistan as the hostile nation. However now India suspects that some meddling done by the United Kingdom was a result of this agreement being reached. Since Ashraf Ghani took over as the President of Afghanistan, he has tilted more towards Pakistan. Moreover Indian officials suspect that he could have been coaxed by the British to go ahead with such an agreement. India however wonders what interest the UK could have in having such an agreement signed between the intelligence agencies of Pakistan and Afghanistan. The Taliban had recently launched its spring offensive. The spring offensive is launched every April by the Taliban and as part of this operation they carry out a spate of attacks. One got to witness a series of attacks that were carried out by the Taliban. However it was the ISI which fed the Afghanistan intelligence with information suggesting that it was India which was behind these attacks. Knowing fully well that the Taliban carries out attacks with the help of the ISI, the Afghan intelligence remained mute. This is largely due to one clause in the agreement that states that the intelligence agencies of Afghanistan and Pakistan shall not criticize each other in public. Moreover the ISI is trying to ensure that for Afghanistan, India becomes the hostile nation. If Afghanistan is to go forward with the agreement with the ISI, then there will be no intelligence sharing with India. For India the intelligence from Afghanistan is very crucial since most of the activities carried out by terrorist groups there affects India. Did UK play a role? Since the agreement became public, there have been voices of dissent in Afghanistan too. Ashraf Ghani who was supporting this agreement had to backtrack under pressure and keep the agreement at bay. Indian suspects that there was a hand of the United Kingdom in putting together this agreement. India is watching closely these developments. An official in the Intelligence Bureau in India says that it is hard to understand what the UK stands to gain out of this exercise. There is information that this controversial agreement was prepared with the help of the UK. NEW DELHI: India suspects British involvement in putting together a controversial agreement between Pakistan's ISI and Afghan intelligence service, NDS. India's annoyance could impact a possible visit to the UK by Prime Minister Narendra Modi, tentatively being planned for the end of the year. While the MoU itself has not yet been made public, a couple of clauses which have leaked out have added to India's anger. One of them is that each spy service would "refrain" from criticizing the other in public, among other things. More important, they agreed to "refrain" from cooperating with "hostile foreign agencies". For years, that was Afghan description for ISI itself. Post the agreement, the "foreign agencies" said sources, indicate India. Pakistan, sources said, has already started a steady flow of reports to Afghanistan about alleged Indian "hand" in recent violent incidents, many of which though bearing clear hand of the Taliban, have not been claimed by anybody. This is in addition to a sustained media campaign within Pakistan blaming the Indian agency, RAW, for blasts and killings in the country. Over the past decade, India has built significant ties with Afghanistan's security establishment, which the MoU seeks to actively destroy, Indians believe. A second inclusion is even more curious - asking Afghanistan to present Pakistan and the ISI in a "favourable" light. Sources here said countries routinely engage in intelligence cooperation with other countries, but they don't involve MoUs, nor do they involve a public relations activity. If implemented, India fears it would mean that the NDS would have to engage in domestic political activity in the same way the ISI does inside Pakistan. Many in the security establishment here are joining the dots - and coming up with some uncomfortable conclusions that much of this is intended to target India itself. The question Indians are asking is what does the UK or other "external" forces hope to get out of this exercise? The MoU has created a popular backlash inside Afghanistan forcing President Ashraf Ghani to backtrack after it became public that even the NDS chief had opposed it. It has lowered his standing both inside Pakistan (because he will not be able to deliver on the MoU) and inside his own country. It has also brought his predecessor Hamid Karzai out of a self-imposed silence to become a powerful opposition voice. As a damage control, Ghani took recourse to some hardline rhetoric against Pakistan, by accusing it of waging an "undeclared war". While publicly India has maintained a stoic front, New Delhi has privately been very critical of the Afghans for allowing themselves to be conned by Pakistan in this manner. Modi met Karzai, who stopped by New Delhi en route to Beijing for a CICA conference last week, indicating India's continued support for him, and even a silent endorsement of his criticism of Ghani's actions. [...] In the letter, the Afghan government asks Pakistan to prove its commitment to peace by taking eight steps. They include a request to place under house arrest members of the Taliban’s leadership councils who are based in the cities of Quetta and Peshawar. It also asks Pakistan to go after the Taliban-affiliated Haqqani network, whose militants were largely spared during Islamabad’s offensive in Pakistan’s northwestern tribal areas. U.S. and Afghan officials suspect the group was behind many of the bloodiest attacks carried out in Afghanistan. On Sunday, Afghanistan’s National Directorate of Security said it seized 16 tons of explosives that belonged to the Haqqani network. They were hidden under firewood in a truck that crossed the border from Pakistan.